My Corns are 86s and they are MDF. To my knowledge, Cornwalls were never made using Baltic Birch, unless possibly as a specific special order. The birch used for decorator models was a custom void-free plywood made to Klipsch's spec. MDF did replace lumber core in the early 80's for models with "fine veneers". Birch plywood was only used for "decorator" models. It was not used in cabinets of any model with a "fine veneer", unless by some obscure deviation from standard. All products with fine veneers were changed from lumber-core to MDF in the early to mid-80's. I believe the Chorus started life using MDF. 1. FIne-veneered Lumber-core plywood: Veneered lumber-core plywood was a furniture industry staple for decades...with table-tops, and furniture cabinet panels often being made with it. The general rule of thumb was that these panels had more stability in temperature and humidity fluctuations than solid wood panels tended to have. And if you were planning to build something which needed to "blend-in" with "TRUE" fine furniture, use of veneered lumber-core was an economically-wise medium to go with. In the old days, the lumber-CORE was made out of numerous different types of wood, with the most common being birch....but as birch became used for more and more things, the move to poplar wood for the core came along. This move was due IN PART to the development of a hybrid poplar tree, which, when after being cut down, its stump would re-sprout with just ONE new tree-trunk...and it was a fast-growth hybrid...so it reached usable height and trunk diameter very quickly. which meant that replanting expenses were negligible, and planting-to-harvest times were shortened. So it was even cheaper to produce. The CORE of lumber-core plywood consists of equal-thickness narrow boards edge-glued together. On both sides of the core panel was laid one much thinner ply, with its wood grain cross-wise to the wood grain of the boards used in the CORE. Additionally a second ply was laid down atop of the first ply on both sides of the panel....this second ply was the fine veneer on one side, with the other side having a "non-fine" veneer laid down on it...both of these second pairs of plys had the wood grain running WITH the grain of the CORE boards. 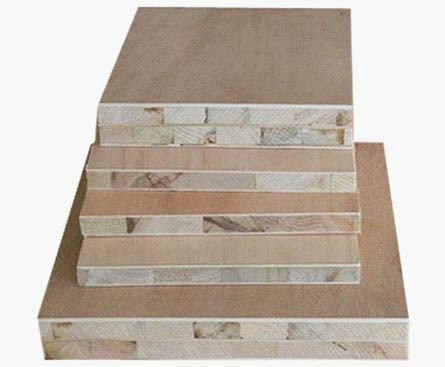 As good as it is, Lumber-core plywood has its own furniture-production issues, among which is warping and curling of the panels under high-temperature with high humidity conditions due to the lumber boards used in its core. So, when using the panels for MITERED speaker cabinets, some of the panels were just too warped/bowed/curled to be practical to use because getting perfect miters sawn on the ends of the panels, and/or getting the "toes" of the mitered edges TOGETHER during assembly was sometimes impossible, which cut into speaker-making profits due to labor-time wasted and/or scrapping of expensive panels.